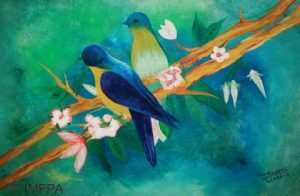 The Mouth and Foot Painting Artists Association (MFPA) is an international,registered society of disabled artists, wholly owned and run by the artists themselves to meet their financial needs. Members paint with brushes held in their mouth or feet as a result of a disability sustained at birth or through an accident or illness that prevents them from using their hands. 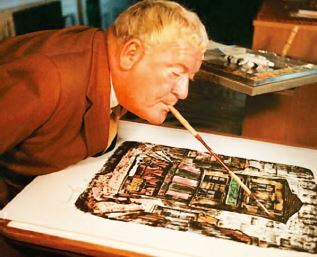 In 1956, a polio victim, Erich Stegmann, who grew up with disabled arms, built a highly successful career in Germany by painting with a mouth-held brush. It was Stegmann’s belief that if painters with similar problems formed a co-operative, it would be possible for them to live by their artistic efforts and enjoy a sense of work security, that until then, had eluded them. This aim was to be achieved by the marketing of their work in the form of greetings cards, calendars, prints and illustrated books. The result has been a unique worldwide art movement called the MFPA Association. With over 800 artists from 74 countries, the MFPA instills in its artists a sense of self-respect and dignity that comes from earning an independent, honest and secure livelihood through the sale of their artwork. In India, we currently support 20 member artists from a diverse cultural background spread across Maharashtra, Jammu & Kashmir, Gujarat, Uttaranchal, Andhra Pradesh, Tamil Nadu and Kerala. They work individually from their homes and regularly submit artwork to us. Our primary objective is to find as many mouth and foot painting artists as possible and bring to the forefront their aesthetic creations by providing them a platform to express their artistic talent. We safeguard and promote their interests, improve their working and living conditions, promote and improve their artistic abilities and skills by promoting the commercial use of their work. By offering financial support, we instill in our members a sense of freedom and dignity as well as an opportunity to earn an independent, honest and secure livelihood through the sale of their artwork reproduced in the form of greeting cards, calendars and other delightful merchandise. We also grant scholarships to promote their development. As co-owners of the organisation,members are the sole benefactors of the MFPA’s financial objectives. Wesupport up-and-coming mouth or foot painting artists by admitting them as students, associate or full members of the organisation, depending on their level of proficiency. With the monthly financial support from us, they are able to concentrate on the development of their artistic skills while remaining financially independent. Once a member, he or she is assured of a monthly income for life, regardless of whether any increasing disability makes it possible for them to continue providing artwork we can market. This obviously removes great fear from their mind; the possibility of losing one’s livelihood due to deteriorating health. We regularly organise exhibitions, conferences and workshops; giving the artists an opportunity to interact and exchange ideas and views. Bandenawaz Badshah Nadaf was born into a poor family in Mumbai in 1987. His parents were devastated to discover he had serious birth defects. He had no left hand and his right hand was just a very short stump. Bandenawaz’s father is a driver and his two brothers work as labourers. His mother is a homemaker. 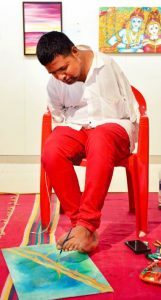 However, despite their difficulties,Bandenwaz’s family helped him to learn to write with his foot. 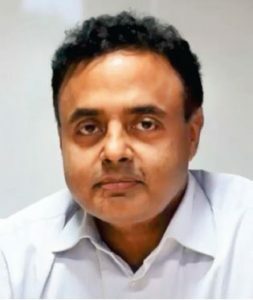 He attended a Hindi medium school upto Class VIII and was a very good student. The guidance and encouragement he received from his family and school to use his foot to write and draw helped planted a seed for his love for art. He began to paint with his foot. He realised the gift he has been blessed with. 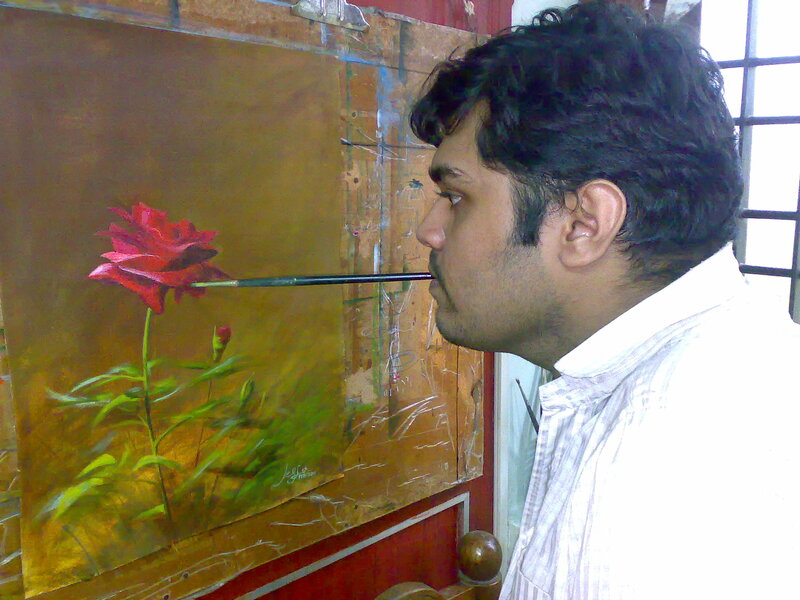 He soon became an accomplished foot painter and won prizes in several inter-school and national level art competitions. Bandenawaz is totally independent and takes care of his own daily activities like eating, dressing, shaving, and bathing. He is also a very good cook. He loves to play the tambourine. He can drive a four-wheeler on his own. Overall, other than being an accomplished foot painter, he is a wonderful sportsman. He is an excellent swimmer and has won two gold medals in the National Swimming Championship for the Disabled. He is also a Yellow Belt in Karate. He has participated in the Mini Olympics for the Disabled and won several prizes in various disciplines. Sheela Sharma was born in Gorakhpur, Uttar Pradesh in 1968. She lost both her arms in a train mishap at the tender age of four. Sheela attended a local primary school where she proved to be an excellent student and developed the ability of holding articles with her mouth and feet, which, in normal circumstances, would have found their place between her thumb and finger. Right from her childhood, she was fond of taking photographs and drawing sketches of people and natural scenes. She used to make geometrical diagrams, biological drawings of frogs, birds etc for her friends and even teachers; besides preparing her own practical file. She participated in many art competitions and won many prizes. She went on to successfully complete her Bachelor’s Degree in Fine Arts. Sheela has been a member of MFPA since 1999 and has conducted several solo exhibitions, including one at the Jehangir Art Gallery in Mumbai. Jesfer Pulikkathody is from a small town in Kerala. He has been suffering from muscular dystrophy for the past several years. Almost his entire body is paralysed from the neck down. 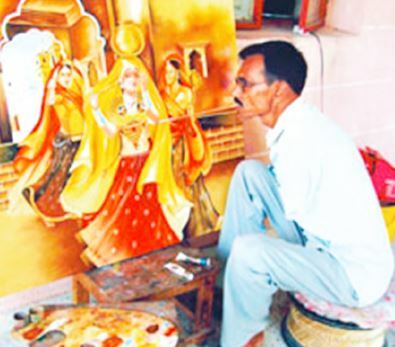 While still at school, he painted using his hands, but due to the progression of the disease, he had to quit school. Over the years, he learned to write and paint with his mouth. After reading the autobiography of the then President of India, Dr Abdul Kalam, he was so inspired and touched that he painted the President’s portrait, and had the opportunity to present it to him personally. In 2007, he was awarded by the Kodamkanthath International Art Foundation for his contribution towards art. Born with a rare congenital condition known as Arthrogryposis Multiplex Congenita that has almost paralysed both her limbs, Srilekha Mandallapalli from Hyderabad is confined to a wheelchair, and requires help with all her daily chores. 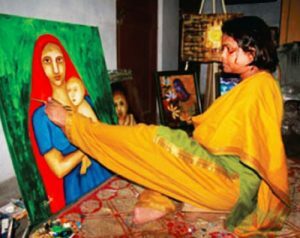 Despite her tragic health condition, Srilekha’s love for art blossomed at a very young age. 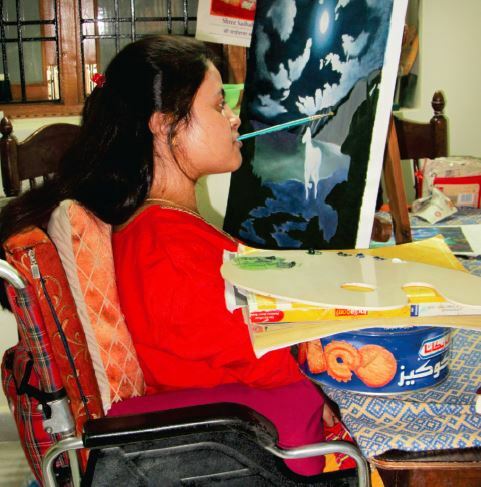 Her disability did not stop her from becoming an accomplished mouth painter. After completing her graduation in 2003, she started fabric painting and then graduated to oil painting in 2007. Her main aim is to motivate and help others with disabilities to come out of their shell and express themselves freely, through their God-given gifts. On a normal day way back in 1970, Manjibhai Ramani from Atkot, Rajkot in Rajasthan was busy crushing sugarcane. In the blink of an eye, his hands accidentally went into the sugarcane crusher. The damage to his hands was so severe that they had to be amputated. Despite this tragedy and subsequent disability, he did not give up living his life. In 1978, he took up mouth painting. He also undertook a five-year degree course in painting at the College of Fine Arts in Ahmedabad, where he studied natural, figurative, abstract and portrait painting. 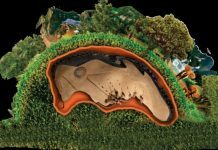 He has participated in several national exhibitions and has also had solo shows. He teaches Fine Arts To students of different age groups. He has been a member of MFPA since 2006. 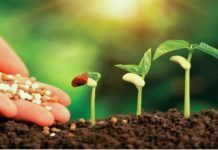 We have been enriched because of each unique and gifted individual who is associated with us. We have learnt much from each of them, and we know that our understanding and appreciation of these fantastic individuals and artists will continue to grow as we expand and embrace more each new day. We will continue serving their interests, be the wind beneath their wings, bask in their success and shine alight on their very special gifts and talents that have made our world more colorful.